Alright real estate agents, let’s get to the bottom of this. Subject lines can be one of the most frustrating components of your real estate email marketing. As I’ve mentioned before, we are very fortunate to have thousands of email subscribers, which gives us the opportunity to test, track, and analyze a lot of different elements to determine what makes a solid email marketing campaign. Recently, I was asked a great question: How can something (like an email subject line) possibly be short, compelling, funny, and eye-catching all at the same time? I know. It doesn’t make much sense. How many words should I have in my subject line to get more opens? Does subject line length even matter? I find that the answers to those questions live in the data and tracking tools you’re using to determine what’s working and what’s not. 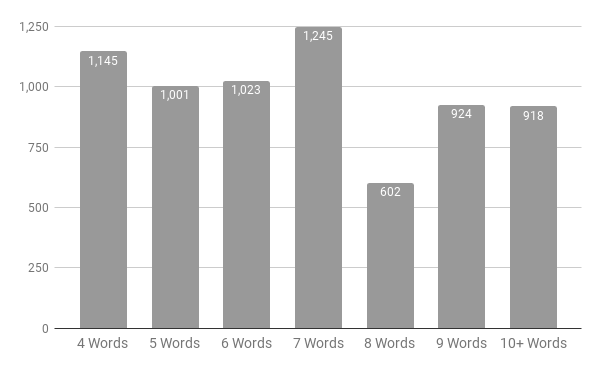 In this post, I’ll walk you through how I collected and analyzed data to determine the ideal word count for writing subject lines that will earn you more opens and better engagement (clicks). There is a common misconception that the right question to ask is: Which subject line length correlates to the higher open rate? But that doesn’t take into account email engagement metrics such as clicks, click-to-open rates, and unsubscribe rates. The question you should really be asking is this: Based on word count, what subject line length gets us the most engagement (clicks)? I bet you can’t guess what happened next! Using our email planning and tracking tool, I used these attributes to analyze our best and worst performing email sends over the past 4 months. This gave me a large enough sample size of ~200 email campaigns and over 100 thousand emails sent. The key here is having a large enough sample size to show some statistical significance. With my data in place, I needed to determine word count of the subject lines from previous campaigns. Most of our subject lines fell between four and nine words. Just to be safe, I included a 10+ words category. You can see that the highest open rates occurred with four-word length subject lines and the lowest open rates were tied to nine-word length subject lines. But the click-to-open (CTO) rates didn’t correlate (or make much sense to me), meaning high open rates did not correlate to high click-to-open rates. Therefore, I needed to look at overall engagement, not just open rates. It makes sense, too—we don’t want our decision-making based on vanity metrics. Another thought: It’s more challenging to be descriptive and actionable in four words than it is in nine words. Thus, more people might click an email with a nine-word subject line because they had a better sense of the email’s content from the start. We LOVE leading and trailing indicators here at Realvolve. That said, we need to take the word count averages and factor them into a measurement process with constant variables to determine which subject line length generated the best overall email engagement. For this, I used the following indicators: sent, open rate, opens, click-to-open rate, and clicks. The winner was seven words for overall engagement. But what happened to our emails when we used eight words in the subject line?! YIKES, it’s nearly half the performance as subject lines with only one less word. WOW! I hope that this experiment and analysis has given you better insight into how to evaluate your own subject lines for open rates, click-to-open rates, and overall email engagement. Granted, you’re sending different types of emails than we are, but there is validity here. You simply can’t “spray and pray.” And if you’re wondering what the ideal character count would be, our seven-word subject lines have an average character count of 45 characters. Do you have any best practices you have discovered with your email marketing and subject lines? Have you found the magic potion for getting your emails opened and clicked? Sign up for the Realvolve Top 10, our monthly roundup of the hottest real estate marketing ideas and insights from across the web. You’ll get a nice little e-digest of articles on lead gen, relationship nurturing, productivity, and more. Subscribe now!